This national award recognizes the most outstanding recent museum building projects. 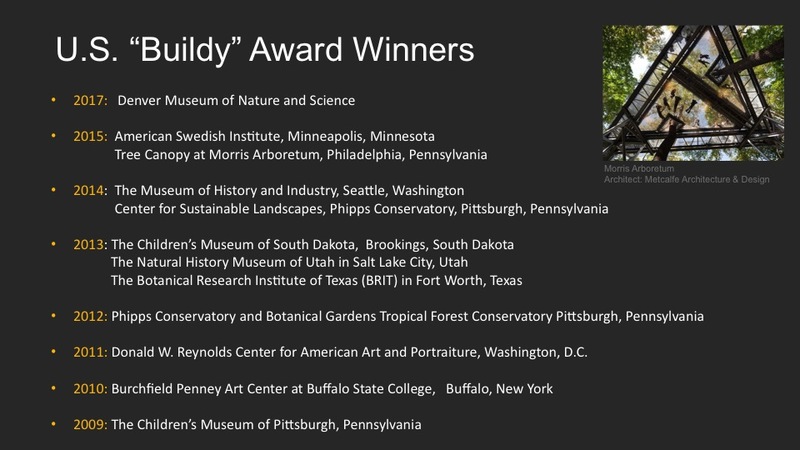 The purpose of the Buildy Award is to increase awareness within the field, and by the public at large, of the value of museums and the need for their ongoing rehabilitation and expansion to serve future generations. The Mid-Atlantic Association of Museums (MAAM) is excited to announce that the recipient of this year’s Building MuseumsTM Symposium’s Buildy Award is the Massachusetts Museum of Contemporary Art (MASS MoCA) for Building 6, the Robert W. Wilson Building. This award recognizes the museum leadership’s exemplary accomplishment through the three-decade process of completing their master plan for the museum. Joseph Thompson, Founding Director of MASS MoCA, accepted the award on March 1, 2019, at a ceremony at the MAAM’s 14th Building MuseumsTM Symposium in Brooklyn, New York. This is the Mid-Atlantic Association of Museums’ tenth annual Buildy Award presentation. 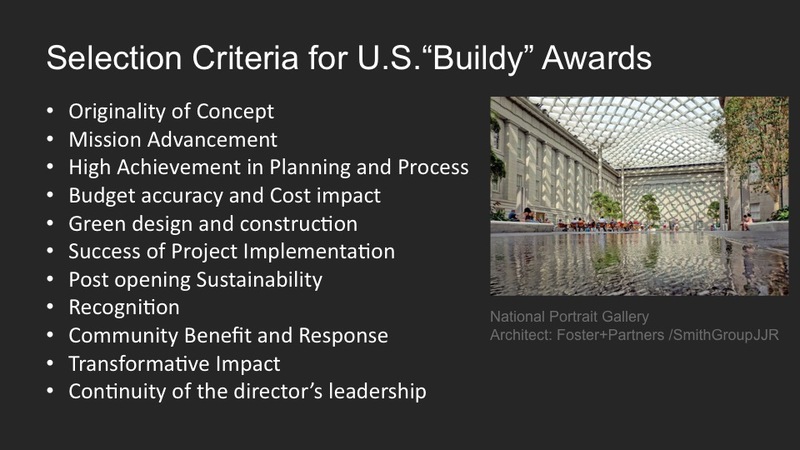 The award recognizes the museum as an institution, its director and staff, and the building/design construction team whose completed museum construction projects demonstrate high achievement in the lessons of the Building Museums™ Symposium: careful, creative planning and diligent implementation, leading to institutional sustainability. The idea for MASS MoCA began in the late 1980s as a space that would exhibit large-scale minimalist art in long-term installations. Over time, the museum’s mission was broadened to become an experimental platform for visual and performing arts, with an emphasis on new commissions for its galleries and stages. The mission of MASS MoCA is to help artists and their supporters create and show important new work, bringing to its visitors bold visual and performing art in all stages of production while also creating a stimulating center of creativity and commerce that brings life and economic vibrancy to its hometown [North Adams, Massachusetts]. Building 6 merges historic architecture and new facilities in a way that supports the museum’s mission and goals. It celebrates and respects the industrial past while looking to the future as an experimental platform for the arts in all media. Through a creative weaving of old and new, the design team maximized the value of the existing buildings and created exciting new spaces within the existing framework. The new architecture opens sight lines and creates dynamic circulation paths. Controlled galleries create inward focus and tailored micro-climates for collections. Photovoltaics offset much of the museum’s electricity needs, and a bikeway through the lower level connects to a growing number of trails and bike lanes for low-impact recreation and commuting, linking the campus to the downtown business district and adjacent neighborhoods. Building 6 is the third and near-final transformation of the 28-building, 19th-century factory site. It expands on two earlier phases and adds 120,000 square feet of gallery space, bringing the museum’s total developed footprint to 550,000 SF (leaving some 50,000 SF still to renovate). Building 6 contains both flexible galleries for changing exhibitions and “museums within the museum” that host long-term exhibitions of artists including James Turrell, Jenny Holzer, Louise Bourgeois, and Gunnar Schonbeck. Spaces between permanent installations allow for periodic performance and experimental visual art. Event space has been added, as well as backstage greenrooms, a catering kitchen, and a large public restroom for outdoor festivals. The ground floor doubles as workshop space and loading dock, and adds conditioned storage and loading areas. The project completed a half-mile “figure 8” circulatory path that not only activates the western third of the factory campus, but also exposes a series of interlocking courtyards, outbuildings, and inner roadways to the public, enhancing the entire museum’s unique sense of place and historical complexity. MASS MoCA’s Founding Director, Joseph Thompson, along with administration and staff, worked closely with all stakeholders and a design team, which included Simeon Bruner, AIA, and Jason Forney, AIA LEED AP, both of Bruner/Cott Architects in Cambridge, Massachusetts. Construction was led by Andrew Prochniak of Gilbane Building Company of Boston, Massachusetts. 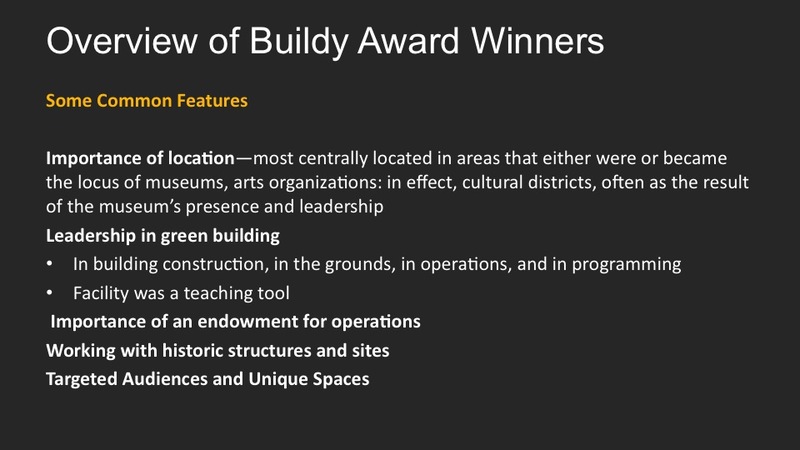 While MASS MoCA has received public accolades and acclaim, the Buildy Award is the only awards program that recognizes the museum leadership and design team for their part in guiding the planning and construction process to a high level of success. It is frequently the case that a museum director is called upon to lead a building project only once in a career, so it is especially challenging to go through the complex process without previous experience. The museum director must address the often competing interests of staff, trustees, financial contributors, artists, architects, engineers, contractors, visitors, and other parties. A major construction effort can make or break a museum. Winners of the Buildy Awards have managed to guide their teams to create lasting assets for their institutions and their communities within a financially sustainable framework. · The substantial increase in visitors both before and after construction is quite impressive, considering MASS MoCA’s distance from major metropolitan areas. · The successful completion of MASS MoCA’s Building 6 is evidence of a steadfast commitment to the vision embodied in the initial 30-year master plan, first developed by the architects in the late 1980s. 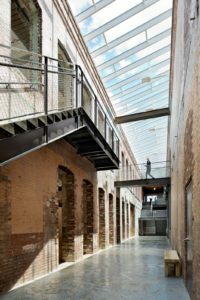 · While many of the interventions required to repurpose the structure for use by MASS MoCA are modern or contemporary in nature, the project retains many artifacts of the facility’s past, giving the museum a unique sense of history and place. · Building 6 allows MASS MoCA to increase its presentation of large-scale works of art and to exhibit major retrospectives of artists in all bodies of work over a long-time horizon and with unusually generous spatial allocation. · MASS MoCA as a whole, and the Building 6 project specifically, involved the reclamation of an industrial brownfield site, satisfying the sustainability aspects of the Buildy Award criteria. · The project was completed on budget – and on schedule – fully funded by a combination of public and private capital, at a remarkably economic cost of $180 per square foot, all in (which included $18M in new endowment to support the increased operating costs associated with the museum’s expanded footprint). Slides presented at ICOM meeting in Milan, Italy July 4, 2016 during session “Best Practices in Museum Building Projects”. Courtesy of Martha Morris, Carole Wharton, and David Greenbaum. 2011: Donald W. Reynolds Center for American Art and Portraiture in Washington, D.C.